INTRODUCTION: Peritoneal dialysis (PD) is an effective and accepted method for renal replacement therapy in patients with chronic renal failure. Various laparoscopic techniques have been described separately to optimize placement and reduce the potential of catheter related complications and failure. 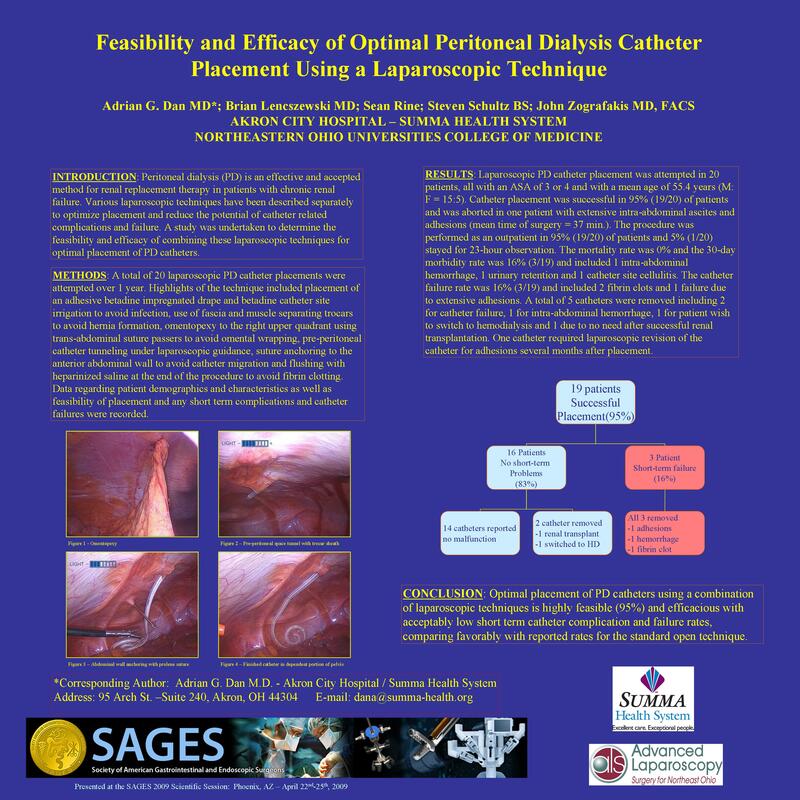 A study was undertaken to determine the feasibility and efficacy of combining these laparoscopic techniques for optimal placement of PD catheters. METHODS: A total of 20 laparoscopic PD catheter placements were attempted over 1 year. Highlights of the technique included placement of an adhesive betadine impregnated drape and betadine catheter site irrigation to avoid infection, use of fascia and muscle separating trocars to avoid hernia formation, omentopexy to the right upper quadrant using trans-abdominal suture passers to avoid omental wrapping, pre-peritoneal catheter tunneling under laparoscopic guidance, suture anchoring to the anterior abdominal wall to avoid catheter migration and flushing with heparinized saline at the end of the procedure to avoid fibrin clotting. Data regarding patient demographics and characteristics as well as feasibility of placement and any short term complications and catheter failures were recorded. RESULTS: Laparoscopic PD catheter placement was attempted in 20 patients, all with an ASA of 3 or 4 and with a mean age of 55.4 years (M: F = 15:5). Catheter placement was successful in 95% (19/20) of patients and was aborted in one patient with extensive intra-abdominal ascites and adhesions (mean time of surgery = 37 min.). The procedure was performed as an outpatient in 95% (19/20) of patients and 5% (1/20) stayed for 23-hour observation. The mortality rate was 0% and the 30-day morbidity rate was 16% (3/19) and included 1 intra-abdominal hemorrhage, 1 urinary retention and1 catheter site cellulitis. The catheter failure rate was 16% (3/19) and included 2 fibrin clots and 1 failure due to extensive adhesions. A total of 5 catheters were removed including 2 for catheter failure, 1 for intra-abdominal hemorrhage, 1 for patient wish to switch to hemodialysis and 1 due to no need after successful renal transplantation. One catheter required laparoscopic revision of the catheter for fibrin clotting. CONCLUSION: Optimal placement of PD catheters using a combination of laparoscopic techniques is highly feasible (95%) and efficacious with acceptably low short term catheter complication and failure rates, comparing favorably with reported rates for the standard open technique.